With the basketball on a temporary pause between series (and LeBron James playing so well that people are actually now digging into the numbers to work out on exactly what metrics Jordan was better – the summary seems to be: at his peak, Jordan was better; but taking the whole career, LeBron seems to win), and the weather pretty inoffensive, I’m struggling to think of how best to open the links. There is the cricket: but I’m not an IPL-watcher, and Ireland’s first Test hasn’t started yet. So, cricket and weather, then I’ve exhausted my small talk: I may have hit peak Englishman. Very often, over a standing coffee appointment we had, my colleague Matt would hit one of his pet peeves: that the economic concept that is simultaneously most useful and most abused is opportunity cost. Fortunately, Tim Harford agrees, which is a good indication that the argument is sound. The biggest abuse of opportunity cost that Tim mentions also applies to DFID: we assume that time is costless, when it is actually an incredibly precious commodity. This applies to our interventions, where we too often fail to account for the opportunity cost of poor people’s time (“hey guys! Come to this 3-day training workshop, it’s free!”) and we too often ignore the opportunity cost of our own time (“hey guys! Come to this hour-long meeting that doesn’t have any obvious objective! It’s free!”). 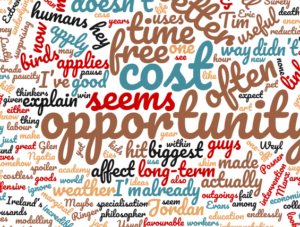 Even Matt and I made that mistake: the opportunity cost of ranting about opportunity cost was time spent on other topics where we didn’t already agree. Dietz is back! This is definitely only one for the economists, but he remains the clearest interlocutor of good macroeconomic research out there. In this post, he explains how mark-ups affect general equilibria. Read it and become a better macroeconomist. In an article that was clearly designed to maximise its chances of getting into the links, Jordana Cepelewicz looks into a new model that uses energy budgeting to explain migration – the migration of birds, that is. It’s modelling at its best: the use of a simplified set of behavioural rules to explain (part of) why complicated things happen. I was really struck by this quote: “[For humans] it doesn’t seem rational that birds will travel thousands of kilometres each way… but… [this] taxing journey is energetically favourable”. Actually when I see the extremes that humans will go through to make a better life, it seems the most natural thing in the world. David Evans and Muthoni Ngatia on the long-term effects of an education intervention (spoiler: none). Maybe I’ve misunderstood this (a skim of the underlying paper didn’t clarify either), but is it surprising that a free school uniform today doesn’t affect outcomes after eight years? Surely the kids would outgrow it within a year – why would we expect a one-off reduction in outgoings to have such long-term effects? Eric Posner and Glen Weyl bemoan the death of the economist as grand philosopher, blaming the specialisation of the academy for the paucity of systemic thinkers like Adam Smith and Karl Marx. In an interpretation that would no doubt irritate them endlessly, perhaps this is simply a case of diminishing marginal returns? The grandest ideas have been had; the biggest impact is now on more modest additions to knowledge. In a way, this ties in with what Lant often argues: what we already know about economies accounts for most of what matters in them – we just need to apply it somehow. This week in ‘research that suggests what seems blindingly obvious’: expanding exports of goods made with labour of a given skill level increases support for free trade among those workers (uses an IV. Usual health warnings apply). Lastly, The Ringer scientifically explores the art of the low-blow. Extremely useful for the manspreading jackasses on the tube at rush hour.